A solidly engineered and eminently practical mini amp - a right little smasher, indeed. Compact, portable size. Solid build quality. Affordability. Useful range of tones. Not enough power for a clean sound at small gigs. The Little Smasher is simple, well-built and extremely useful. Minimal controls, but exactly what you need. While large amplifier heads in the 50- to 100-watt range still have their place, there has for some time now been a trend for low-wattage guitar amps. They're easier to transport, capable of natural distortion at lower volumes than some of their higher-powered counterparts and are often still plenty loud enough for small gigs and rehearsals. "The unit is nicely responsive and capable of a wide range of tone, from sparkly clean to crunchy, Marshall-esque rock sounds." 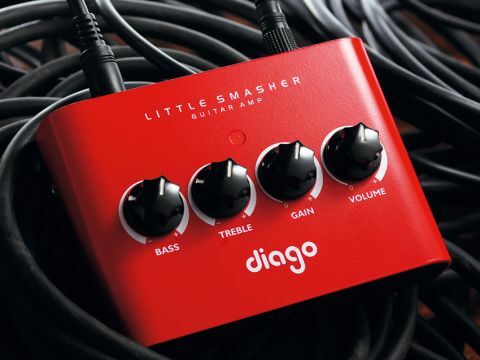 While Orange's Tiny Terror and other diminutive valve heads have been making waves, Yorkshire-based Diago - known for its pedalboards and the Powerstation effects pedal power system - has been thinking along similar low- wattage lines. But rather than valves, the firm has gone down the less bulky solid-state route to take the portability aspect as far as it will go. The result is a five-watt guitar amp that's no bigger than a stompbox and will easily sit in your hand, while still being perfectly capable of driving a 4 x 12 cabinet. Powered from a supplied nine-volt adaptor, the Little Smasher is an extremely solid little unit with a casing built from two interlocking pieces of 2mm/14-gauge fabricated carbon steel. On the rear panel, besides the power connector and on/off switch, you get the standard jack guitar input and a speaker output that can drive speakers of between 4 and 16 ohms up to the size of a 4 x 12. Four knobs control the sound, so as well as gain and volume we get active treble and bass tone controls, each of which supplies up to 15dB of boost and up to 30dB of cut. The Little Smasher will sit squarely on top of any speaker cab you wish to put it on and can be kept from slipping by the Velcro strips or rubber foot pads supplied. The power adaptor is a practical in-line type, is not too bulky and has over two metres of cable. We'd wager that the first thought of any guitar player confronted with the Little Smasher would be about how loud it can go, and fully turning up the gain and volume knobs shows that it can belt it out. Yep, it's certainly loud enough for home practice and well capable of filling the average living room with sound. Volume issues aside, the unit is nicely responsive and capable of a wide range of tone, from sparkly clean to crunchy Marshall-esque rock sounds, delivered courtesy of four analogue-modelled cascading gain stages and, considering that it has just two knobs, a surprisingly versatile EQ with a nice line in low-end thump. If you own a Marshall stack, say, but can't really use the full rig to practise at home because of volume issues, or can't achieve useful overdriven sounds at low levels, the Little Smasher could be for you. It will let you practise with a decent sound at tolerable volumes without resorting to headphones - it may be worth its asking price just for that. Its greatest virtue, though, is its portability: it can easily slip into a coat pocket or guitar case, perhaps doing the business at a gig where speakers are provided, but where you don't have the transport available to take your usual amp. It could also be an essential part of any gigging first-aid kit - always on hand to step in to replace a broken amp head or a combo (if you pack a lead that can connect the combo's speakers). Having a Little Smasher fixed to your pedalboard or stowed in your gigbag could be a very smart move.